My boy is turning 6....ARGH!!!! I'm going to try to savor the last 2 weeks of his 5th year. There was (and actually still is) a big decision to be made in our house. What kind of party are we going to have? Pirates, Lego Star Wars, Rock and Roll? 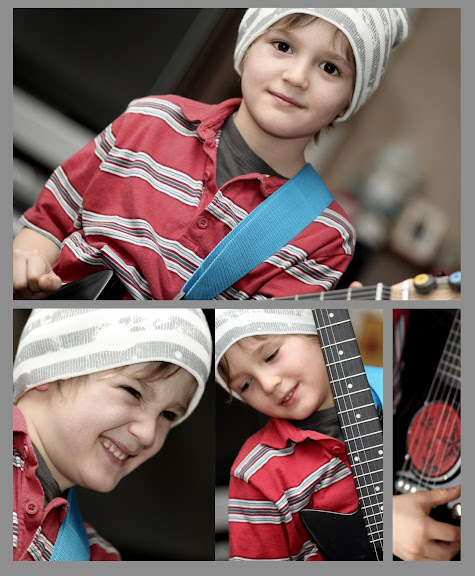 Well, I had to do the Rock and Roll invites because the pictures were so darn cute, but E is not so sure he wants to carry over the theme to his party. I'm going to try to convince him otherwise. Usually by this stage in the game, I have everything figured out, but I'm not as prepared this time. It's not as easy to plan parties with opinions from the guest of honor. He is sooooo excited about his birthday and even put the invitations in the envelopes tonight; I think he's making sure they get mailed. I've threatened not to a couple times this week because of his misbehaving. On another note, I still cannot figure out what has gone wrong with my ability to center the text on the blog...it's driving me crazy! Is it bothering anyone else?